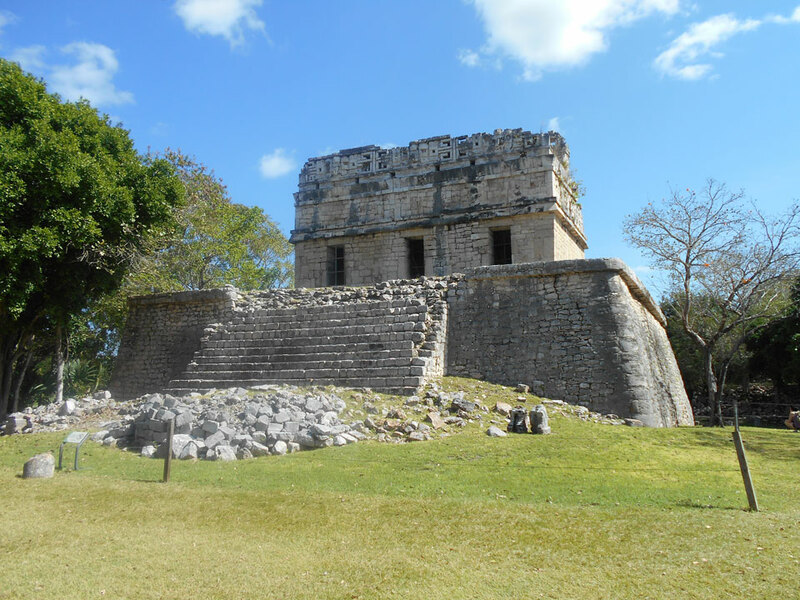 Our day started at 7.10 am when we were picked up along with other excited holidaymakers by our bus driver, Leo, for our 2½ hour journey to Chichen Itza. Although it was a fair jaunt, we got chatting to some people on the bus and before I knew it we’d arrived. Leo even stopped outside a tequila distillery so we could take pictures of the field of Agave – the plant used to produce the drink. When we arrived we were shown in to the Mayaland Hotel, the only hotel located within the grounds of the famous temples, with a private entrance to the ruins. This excursion really offers great value as it includes transfers, lunch, as well as use of the hotel’s pool and sun loungers! The hotel itself is wonderfully historic and tranquil; you really feel like you are experiencing the fascinating Mayan culture. Built in 1923, it has been named one of the world’s top hotels by National Geographic and Conde Nast Traveller magazines. After being introduced to our tour guide, Ceaser, we were all given a free bottle of water and shown to entrance of the site, being given information about the history of Chichen Itza along the way. The tour itself lasts around 2½ hours, after which we were shown back to the hotel for lunch. We had the afternoon free to enjoy the pool or wander around the site again at our leisure. We chose to look at the ruins again and buy some souvenirs at the many stalls offering handmade gifts. My favourite part of the tour was visiting the Kukulcan Pyramid, which is the biggest structure within the park. The building is fascinating, with its unique design depicting the image of a feathered serpent. What was even more amazing was learning that twice a year – 20th March and 22nd September, known as the spring and fall equinoxes – the shadows cast by the angle of the sun create the illusion of a massive serpent descending the pyramid. Lunch was a buffet serving authentic Mayan cuisine including fresh tortillas cooked in front of you on traditional Mayan stones; even the staff were dressed as they would have been in the times and entertained us with several Mayan dances! Not such an early start the next day! We arrived at the water park at 10 am and had 3 hours to enjoy the park before our dolphin swim at 1pm. Wet ‘n Wild has loads of slides, so you can feel the thrill of a white-knuckle water slide, take a tandem ride on a huge ring or a relaxing drift around the lazy river. I enjoy all kinds of water slides so trying them all was a must! I started by dipping my feet in the wave pool to slowly acclimatise to the water, as the wave machine wasn’t on yet so the water was peaceful. Typically I had no sooner dipped a toe in the water than the waves started and I was drenched – but this was a good thing as it meant I was ready to get on the slides! We choose the highest one first where you shoot down in a massive ring, facing each other – it was extremely fast and not for the faint-hearted. I thoroughly enjoyed it, the faster the better in my opinion! Swimming with Pablo the Dolphin! When it was time for our dolphin swim we made our way over to the other side of the park, stopping along the way to photograph a very large and beautiful iguana basking in the sun. Our dolphin’s name was Pablo and he was one of the sweetest and friendliest animals I have ever met. At only 9 years old he was still a baby and his trainer, Lucy explained that dolphins are so intelligent, they need to be constantly stimulated or they will lose interest. For this reason each activity was very quick and the trainer ensured he was given a treat after each one such as a sardine, a piece of crushed ice or a quick play with his favourite ball – the only thing that would hold his attention apparently. I was lucky enough to get to kiss Pablo as well as give him a hug and get pulled along the water by him. My favourite activity was giving him a hug as he actually smiles and enjoys it when you rub his tummy and show him affection. He very much reminded me of a little puppy! 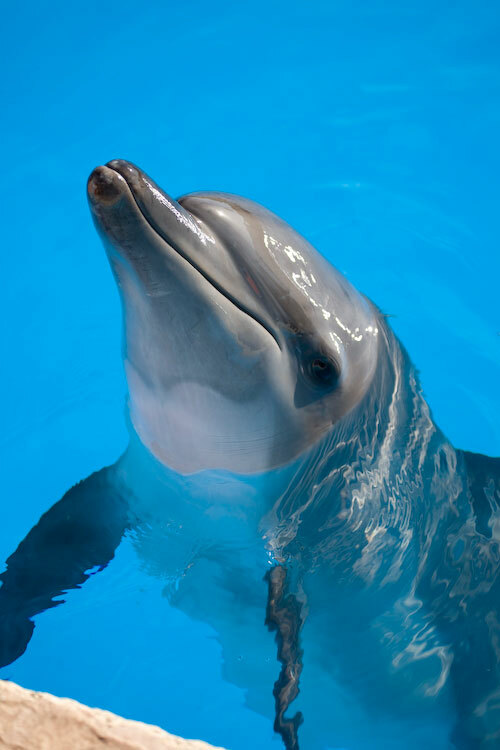 Dolphins have the softest skin and are so smooth to touch as they shed their skin every two hours! When our swim was finished I didn’t want to leave Pablo but he waved goodbye to us and jumped about 15 feet out of the water with such grace, then swam off to play with his friends. What a completely surreal experience. I was on cloud 9 for the rest of day, telling anyone that would listen about Pablo! What a Once-in-a Lifetime Experience! 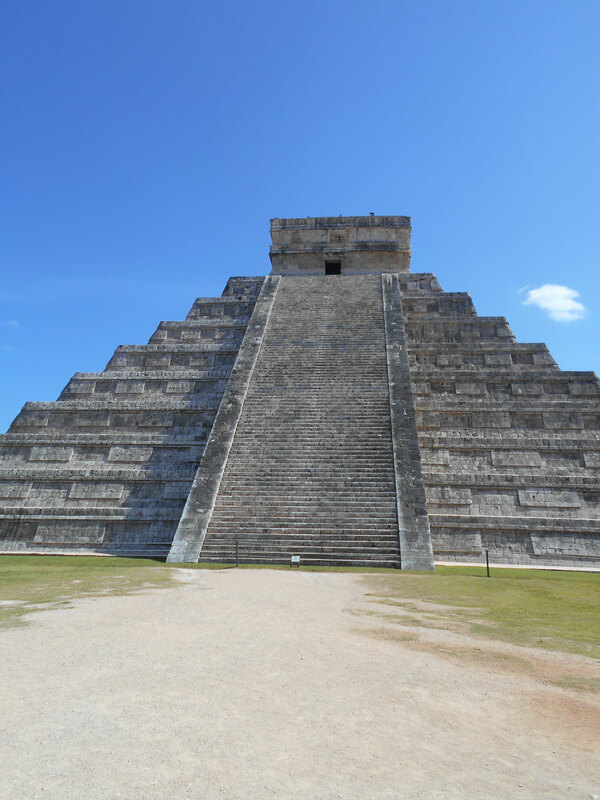 Chichen Itza is definitely a day trip worth doing and is much more than a guided tour around the site. It was a once in a lifetime opportunity to completely embrace and learn about the wonderful Mayan cultural heritage. I would recommend wearing comfortable walking shoes to Chichen Itza as there’s a lot of walking and those wearing sandals or flip flops said their feet ached at the end. 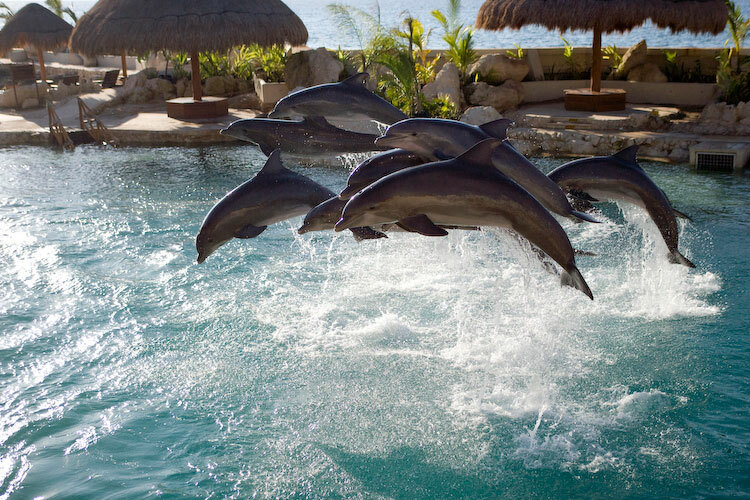 Swimming and interacting with Pablo the Dolphin was an unforgettable experience and a must-do if you’re in Cancun. It’s very important not to wear any sun cream whilst in the water with them as it can make them ill, so be sure to take a shower between enjoying the park and the swim. Lifejackets are provided which cover your shoulders so you won’t get burnt whilst in the water. We packed a lot into the rest of our holiday, also going on a boat trip to the idyllic Isle of Mujeres, where we went snorkelling on the coral reef. 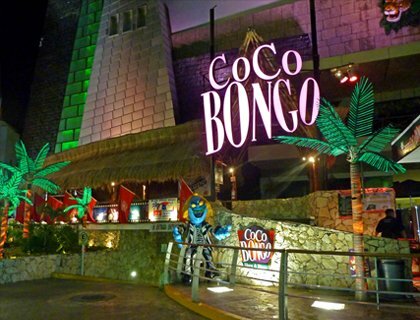 We also went to Coco Bongo nightclub which was the most amazing cabaret show I’ve ever seen. They had everything from aerial performers to big name tribute acts to an acrobatic fight scene between Batman & Spiderman! 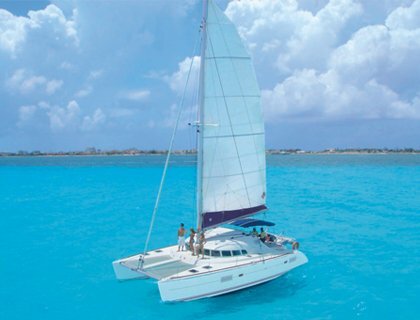 Hopefully this article will be useful if you’re undecided about what to see and do when you visit Cancun. You’ll never be bored when you’re there, there’s something for everyone and all ages. The lovely Mexican people really made our holiday; they are so kind, warm, respectful and friendly and can’t do enough for you. I can’t wait to go back! If you’ve experienced an AttractionTix tour and want to share you experience, please contact Farrah Hedwat, Blog Editor.